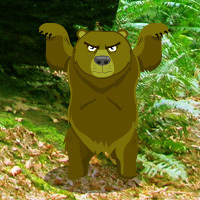 G2R Dancing Bear Forest Escape is another point & click escape game developed by Games2Rule. In this game, you came to see the beauty of a dancing bear forest. But unfortunately, you missed the way out from this place. You have to find the way to escape from the dancing bear forest by finding useful objects, hints and by solving puzzles. Click on the objects to interact with and solve puzzles. Good luck and have fun! Got the jump-around glitch, and it dumped me somewhere I hadn't been yet. Finally found my way back to start. Just realized I was past the mango door when I jumped. It closed behind me when I found start. PLS. those Bears are supposed to be scary? LOL Looks like dancing Bears to me! feather for bird in 2nd set. Hi Bandy. I find the bears distracting. Through the grasshopper door with nothing in inventory. Think I've compensated for the magic ride around the scenes. Hi YA Lurker ") Long time no hear! You can ignore the colors in the arrow clue. Out. The green gems in the 3rd set are hard to see. They're all against green background. On an unrelated note, wasabi Oreos are available in Asia. Wish they were in the U.S.
stuck in second set of scenes. Need one more grass hopper, 2 tomatoes and 3 fruit for first set of scenes. Jenny, you should only need 1 tomato. Check for sneaky spots, like the floor panel where the jumbled number puzzle is. (clue for that in 3rd set). I think you should have 2 green fruit missing. Did you do the "one of these things is not like the other" puzzle? Every item in the row should have an x or check. Thanks Lurker, I have done everything now. Even in the third set and still missing that 1 green fruit for the first set. POP! finally found the last one under a rock in the scene with the Pink 1 snail. Nice once I found a sneaky mango and tomato. Thanks. Can't play this. The bear is too annoying. Did not score the game because I did not play it.